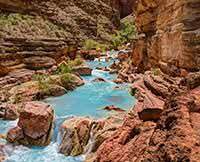 Prior to this one, I had made three Grand Canyon river trips with Western River. And I thought I knew. But I had no idea. Now, after my fourth trip, there are still more questions than answers about what the Grand Canyon, this magic place really is to me. Thats why I have to come back. My thanks go to Western River for the perfect organisation of the trip, to our wonderful guides and to the other guests who became my friends and whom I shall never forget.